This will not be a long post – I have had a busy week with a three-day roadshow in Poland and it is after all Saturday night – but it will be long enough to yet again point the fingers at the ECB for its deflationary policies. Earlier this week the Brussels’ based think tank Bruegel published a new data series for the Divisia money supply for the euro zone. I very much welcome Bruegel’s initiative to publish the Divisia numbers as it makes it possible to get an even better understanding of “tightness” of monetary conditions in the euro zone. Standard simple-sum monetary aggregates, like M3, sum up monetary assets that are imperfect substitutes and provide different transaction and investment services. Divisia monetary aggregates, originated from Barnett (1980), are derived from economic aggregation and index number theory and aim to aggregate the money components by considering their transaction service. No Divisia monetary aggregates are published for the euro area,in contrast to the United Kingdom and United States. We derive and make available a dataset on euro-area Divisia money aggregates for January 2001 – September 2014 using monthly data. We plan to update the dataset in the future. Using structural vector-auto-regressions (SVAR) we find that Divisia aggregates have a significant impact on output about 1.5 years after a shock and tend also to have an impact on prices and interest rates. The latter result suggests that the European Central Bank reacted to developments in monetary aggregates. Divisia aggregates reacted negatively to unexpected increases in the interest rates. None of these results are significant when we use simple-sum measures of money. Our findings complement the evidence from US data that Divisia monetary aggregates are useful in assessing the impacts of monetary policy and that they work better in SVAR models than simple-sum measures of money. 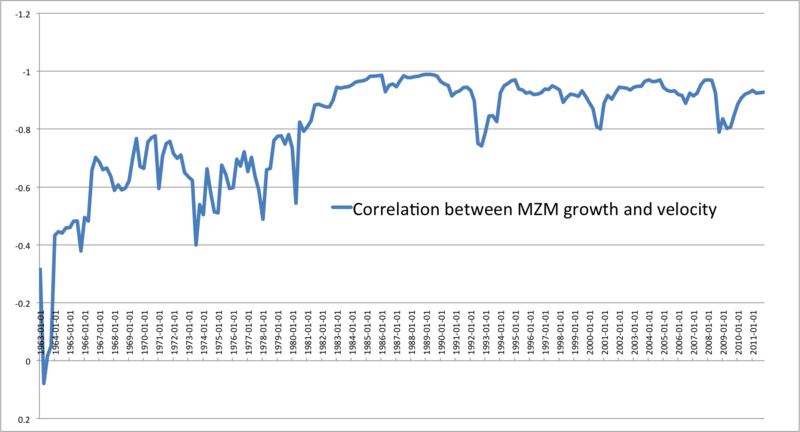 I have used Darvas’ data to calculate a simple ‘Money Gap’ to assess the “tightness” of monetary conditions in the euro zone. My assumption is that prior to 2008 monetary conditions in the euro zone were “well-calibrated” in the sense that nominal GDP grew at a steady stable rate and inflation was well-anchored around 2%. I have therefore assumed the pre-crisis trend in Bruegel’s Divisia money supply ensures “nominal stability”. In the pre-crisis years the euro zone Divisia money supply grew by on average just below 8% per year. 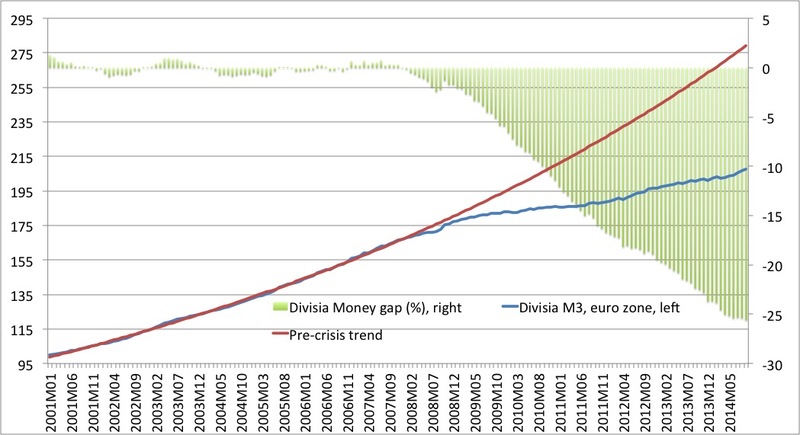 The ‘Divisia Money Gap’ is the percentage difference between the actual level of the Divisia money supply and the pre-crisis trend in the Divisia money supply. The graph above tells two stories. First, prior to 2008 the ECB kept Divisia money growth ‘on track’. 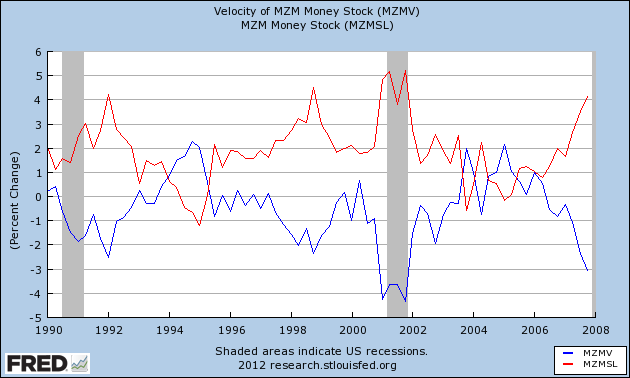 In fact at no time during the pre-crisis years was the Divisia money gap more than +/- 1%. 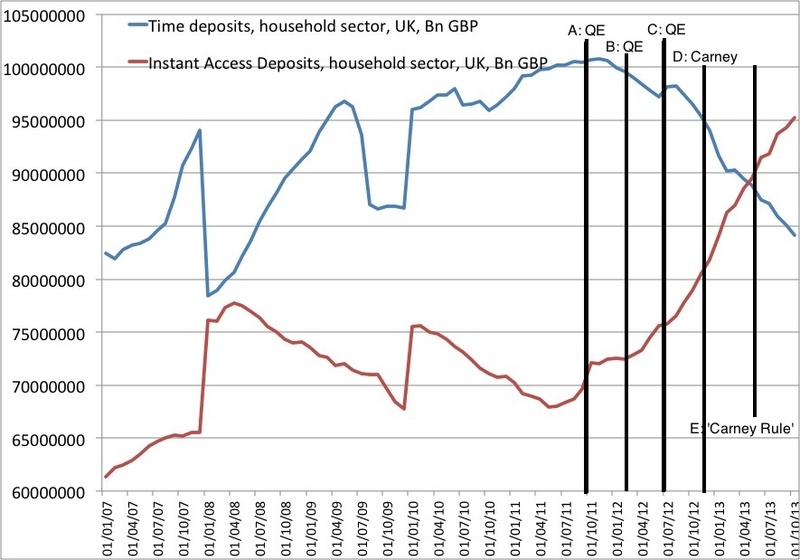 Obviously the ECB was not targeting the Divisia money supply, but nonetheless conducted monetary policy as if it did. This I believe was the reason for the relative success of the euro zone in the first years of the euro’s existence. 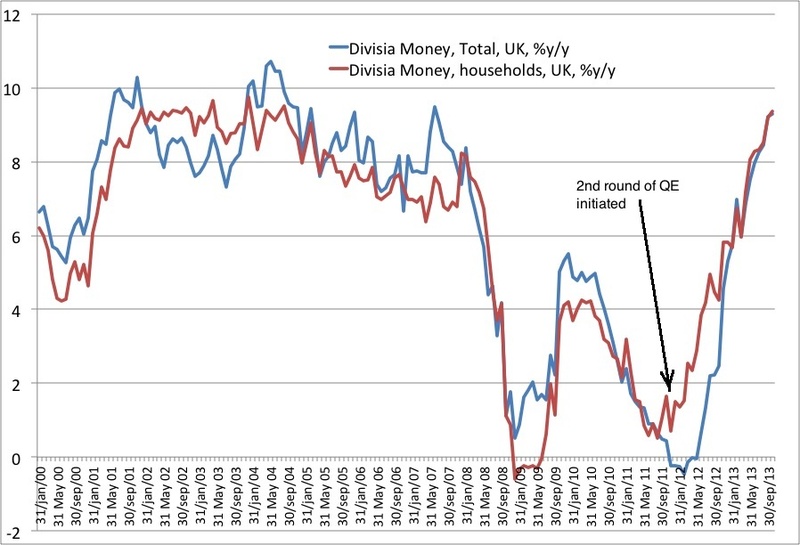 Second, starting in Mid-2007 Divisia money supply growth started to slow dramatically and ever since the growth rate of Divisia money has been significantly below the pre-crisis trend leading to “Divisia Money Gap” becoming ever more negative. This of course is a very clear indication of what we already know – since 2007-8 monetary conditions in the euro zone has become increasingly deflationary. Concluding, this is just more confirmation that monetary policy is far too tight in the euro zone and bold action is needed to ease monetary conditions to pull the euro zone economy out of the present deflationary state. William Barnett has a comment on his blog about the comments from Scott Sumner, Bill Woolsey and myself. “Regarding the insightful commentaries that just appeared on the three blogs, The Money Illusion, The Market Monetarist, and Monetary Freedom, I just posted the following reply on the Monetary Freedom blog. All very interesting. The relevant theory is in the appendixes to my new book, Getting It Wrong. The source of the new Divisia data is the program I now direct at the Center for Financial Stability in NY City. The program is called Advances in Monetary and Financial Measurement (AMFM). AMFM will include a Reports section discussing monetary conditions. Although not yet online, that section will address many of the concerns rightfully appearing in the excellent blogs, The Money Illusion, The Market Monetarist, and Monetary Freedom. The distinction between the AMFM Reports section and the AMFM Library, which is already online, is that the AMFM Library only relates to articles published in peer-reviewed journals and books, while the AMFM Reports section will relate to the public media and online blogs. I certainly hope to be able to follow up on William’s work in the future. I am particularly interested in the reasons for the sharp drop in Divisia M3 and Divisia M4 in 2008/09. The numbers surely confirms that monetary policy has dramatically tightened in 2008 – as Market Monetarists long has argued – most notable Scott Sumner and Bob Hetzel.